In honor of International Nurses Day on May 12, we are sharing the story of nurses who are helping to lead the way in patient care and technological innovation in health care. International Nurses Day is celebrated around the world every May 12, the anniversary of Florence Nightingale’s birth. 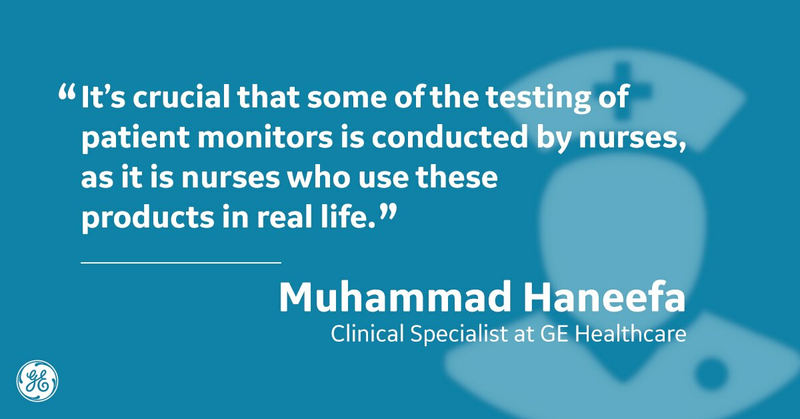 Before a monitoring device from GE Healthcare ever reaches a nurse in a hospital, many nursing hands have already helped to vet the technology. It all begins in Helsinki, Finland, where GE Healthcare has a patient monitoring center of excellence. In this facility, nurses put patient monitors through rigorous in-house and hospital tests to ensure the devices will fit nurses’ needs in clinical settings. Kristiina Järvelä joined the center of excellence after eight years as a registered intensive care nurse in the cardiac surgical intensive care unit of the Helsinki University Hospital. Bypass surgeries, aortic valve replacements, heart and lung transplants – it was a challenging and rewarding job, and she loved it. Except for the night shifts. Finding a job as motivating as that of an intensive care nurse, but with more reasonable working hours, was no easy task. 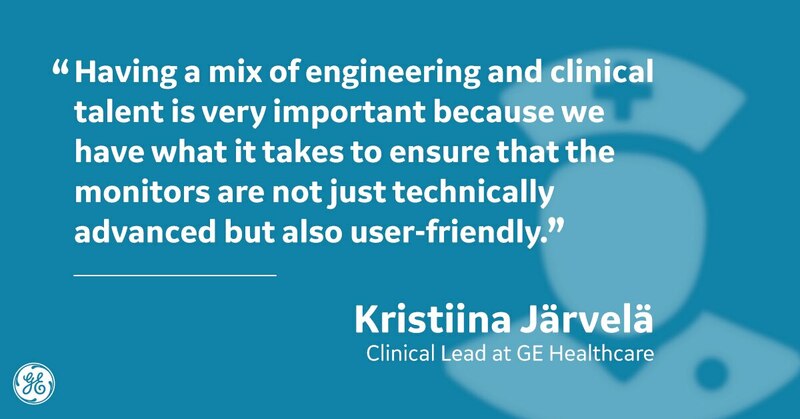 Luckily, Järvelä found GE Healthcare, where she could put her clinical expertise to use. “I miss the intensity of an ICU or an operating room. Urgent has a whole different meaning when it’s about a patient instead of paper work. But at GE, even the paper work is about patient safety. That keeps me motivated and that is why I love my job,” Järvelä says. Today, after 10 years at GE, Järvelä is a Clinical Lead responsible for example clinical tests. She designs hospital tests, liaises with the program developing the products as well as the research organizations, and coordinates collaboration with hospitals. Together with an engineering team, she helps to ensure the patient monitors developed in Helsinki are ready to enter hospital tests and that the nurses using the products are up-to-date on executing according to established protocols. She also assures the tests run smoothly, gathers input from hospitals and feeds it back to the GE engineers, who can then make adjustments, if needed. “Having a mix of engineering and clinical talent is very important because, together, we have what it takes to ensure that the monitors are not just technically advanced but also user-friendly, helping clinicians increase patient safety and quality of care,” Järvelä says. Muhammad Haneefa joined the center of excellence as a Clinical Specialist after three years as a nurse at the Government Medical College Hospital Kottayam in Kerala, India. 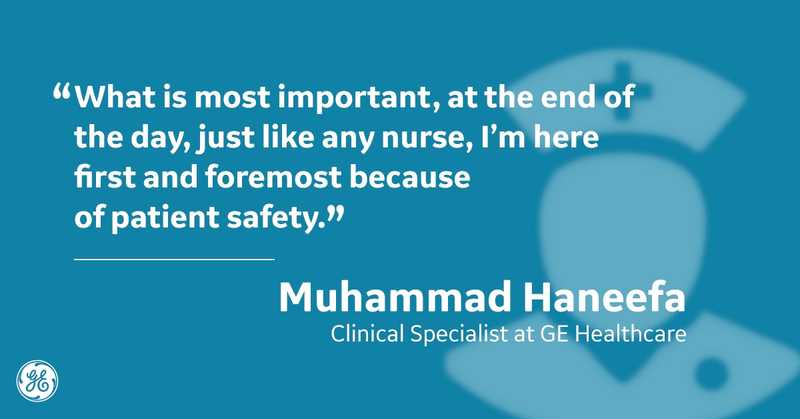 Haneefa’s clinical expertise and valuable nursing experience from a different part of the world are a perfect match for the center of excellence, where he feels he can help even more patients than he did as a nurse. Help us celebrate International Nurses Day by using #IND2018 and #VoiceToLead on Twitter.